Welcome to Fernhill. We’re so glad you are here! There’s a lot going on, from using natural ways to cool and clean water to providing habitat for birds and wildlife and opportunities for people to enjoy being outside. Fernhill has it all. As you walk along the trail, see if you can find clues to help you learn more about this place. Look around. What do you see? Where do you think this water came from? It’s used water from homes and business that has been cleaned at the Forest Grove Facility. Fernhill Lake is an important part of how we clean and cool water, it also provides habitat for birds and wildlife. As water sits in the lake and wetland area overnight, it has a chance to cool after the sun goes down and air temperature drops. Native plants in the wetland also take up nutrients to help clean the water as well as absorbing water and releasing it into the air, which helps cool the water. Listen for the sound of a waterfall. Look to your left, can you see it? The waterfall adds oxygen to the water which supports plants and wildlife. Look down. Can you spot bullfrogs in the water below? 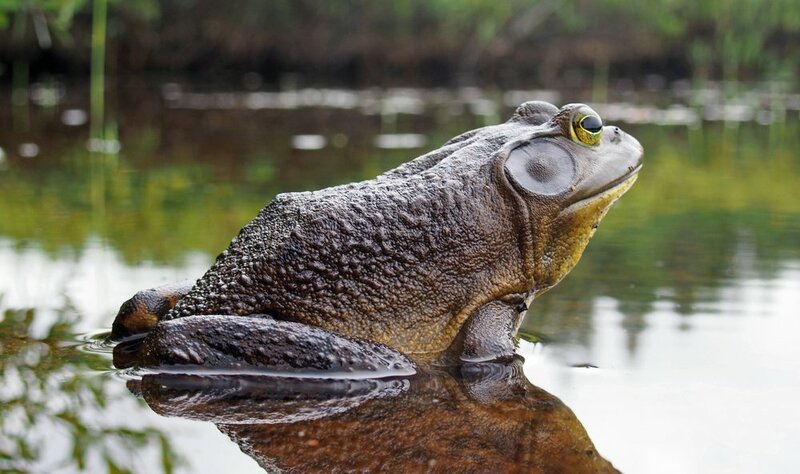 You may be able to hear a bullfrog before seeing one. Bullfrogs are hard to spot because they blend into their surroundings. Hibernate in the winter by covering themselves in mud and waiting for warmer weather. Are named for the cow-like call males make. Are an introduced species in the pacific NW, they are native to the eastern US. Stop and look around. Do you feel different when you are outside in nature than when you are inside at home or work? You might notice this area looks different than the rest of Fernhill. The Water Garden was designed to promote wellness and healing. Fernhill is a place where people can leave behind the stress of their daily lives and enjoy nature. What’s different about this area? Water from Dabblers Marsh flows from parking lots, driveways and rooftops and is stored during the rainy months. In the summer when it doesn’t rain, the marsh is dry and full of plants. Beavers are an indicator of a healthy ecosystem. Can you spot the beaver dam to your left? In the winter the dam creates a pond that is used by fish, birds, insects and other living things. Beavers are nature’s engineers. What bird sounds do you hear? At Fernhill, some birds stop and some birds stay. The visiting birds stop on their migration, sometimes from thousands of miles away. At, Fernhill they find food, water and shelter, all the things they need. Can you spot any of these birds that stay year-round at Fernhill? Fernhill is also home to a Bald Eagle’s nest. Can you see it high in the trees just past the pond on your right? Did you know plants can help clean and cool water? Fernhill uses thousands of plants to shade water, keeping it cool, while plant roots take in nutrients to help clean water. How many different kinds of plants can you see? Did you know, on an average the Forest Grove facility cleans 5 million gallons of used water? From here, you can see a blue water monitoring station. As water leaves Fernhill, it’s tested to make sure it’s ready to rejoin the Tualatin River, just beyond the trees. The Tualatin River needs cool, clean water to support the fish, wildlife and people that depend on it. Listen closely. Do you hear insects buzzing? Pollinators are insects and animals that carry pollen from plant to plant, which helps produce food. One out of every three bites of food we eat is made possible by pollinators. Butterflies can determine what kind of plant they have landed on by tasting the plant with their feet. Dragonflies are such effective hunters, they usually catch 90% of the prey they attack. Mason bees are valuable pollinators of fruit and nut trees, berries, and a few early spring flowers. A single mason bee will visit between 1,600 to 2,400 blossoms daily, and pollinate 90% of them. Why is this dead tree here? Snags are dead, standing trees that provide important habitat for insects, birds and other wildlife. While snags can result from fires or lightning strikes, this one was placed here on purpose.